The Carbolite CRF/1 CO2 Reactivity Test Furnace complies with the Standard test method for the determination, by a loss in mass method, of the reactivity to carbon dioxide of calcined petroleum coke used in the manufacture of anodes for the production of aluminium. The reactivity of a calcined coke to carbon dioxide is assessed by determining the loss in mass of a sample exposed in accordance with the following chemical reaction: C + CO2 -> 2 CO. This determination allows an assessment of the later anode reactivity to carbon dioxide in the electrolysis cell. Once the CRF/1 reaches the maximum operating temperature of 1000 °C an audible alarm is sounded to indicate when the sample can be loaded. The coke sample of 5 g, having a grain size of 1 mm to 1.4 mm, can then be placed into the quartz tube. 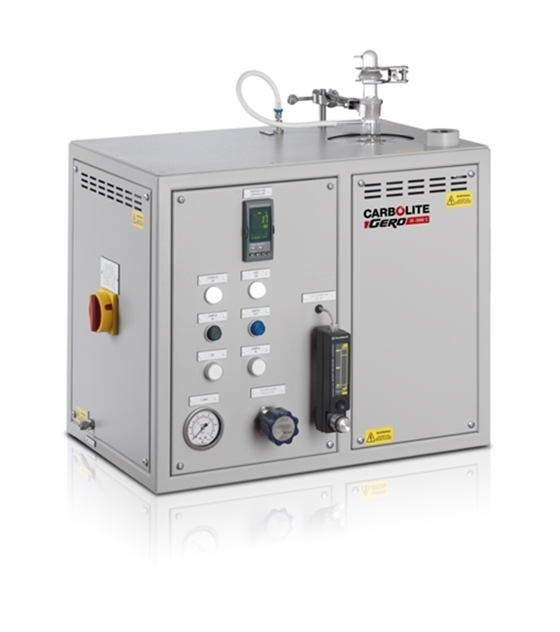 An automatic mass flow meter then opens the CO2 gas flow for approximately 100 minutes exposing the sample to a carbon dioxide stream of 50 l/h. The loss in mass is then measured. The CRF/1 is a single zone tube furnace with good vertical temperature distribution which heats up to 1000 °C. The temperature is maintained with an accuracy of ± 1 °C. The furnace has a tube reactor with two quartz tubes and a cap with a ground glass joint. An external tube containing a gas inlet allows the gas to flow down to the bottom of the tube and be preheated before flowing up through the coke bed. Fitted inside the external tube is an inner reaction tube incorporating a porous disc so that the base of the coke bed lies in the middle of the furnace.